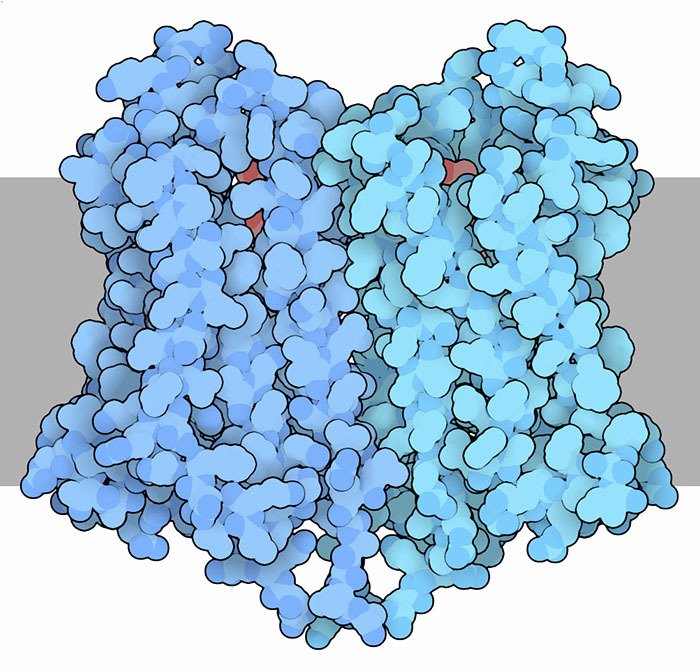 Opioid receptor, with a morphine analog in red and the cell membrane shown schematically in gray. The world is facing a crisis of pain. On one hand, countless people throughout the world are suffering from chronic pain from cancer and other ailments, but they do not have access to our most effective treatment for pain: morphine and other opioid drugs. On the other hand, the western world is suffering the consequences of widespread availability of opioids. Legally-prescribed opioids give relief to patients with chronic pain, but problems with tolerance and addiction have lead to widespread abuse. Pain can be a good thing. For instance, the pain we feel when touching a hot stove makes us jerk our hand away, preventing harm. This pain is the result of a complex signaling process: the problem is sensed by receptors in the hand, signals are sent to the brain where they are interpreted as being painful, and finally a signal is sent back to the hand to cause it to jerk away. This process relies on a fine balance between signals that stimulate the message, increasing the level of pain based on the severity of the problem, and signals that inhibit the message, ensuring that we are not overwhelmed. Chronic pain occurs when this balance is not correct, and doctors prescribe opioids to help correct the balance. Small peptide neurotransmitters, called enkephalins and endorphins, are the natural inhibitors of pain signals. They bind to opioid receptors in pain-signalling cells of the nervous system. Opioids mimic this action, also causing opioid receptors to slow down the pain response. Opioid receptors are typical G-protein coupled receptors (GPCR) that bind to neurotransmitters or opioids on the outside of the cell, and launch a response through G-proteins inside the cell. The structure shown here (PDB entry 4dkl) is one type of opioid receptor bound to an analog of morphine. Open and closed forms of dipeptidyl peptidase III. An enkephalin is shown in red. As with all neurotransmitters, it is important to stop the signal when it isn’t needed any more. Enkephalins and endorphins are rapidly broken down by peptide-cutting enzymes, stopping their pain-reducing action. Dipeptidyl peptidase III, shown here from PDB entries 3fvy and 5e33, is one example. It breaks down neurotransmitters by chopping off two amino acids from one end. Several types of opioid receptors are made in our nervous system to manage the many shades of pain signaling. There are three general classes of opioid receptors, termed mu, kappa, delta, and a related nociceptin opioid (NOP) receptor. Atomic structures have been determined for examples from each of these classes, in PDB entries 4dkl, 4djh, 4ej4, and 4ea3). To explore these structures in more detail, click on the image for an interactive JSmol. Scientists have designed proteins to bind to opioid drugs, for use in drug testing and in treatment of addiction. You can see the structure in PDB entry 5tzo. The mu opioid receptor shown above forms a dimer in the crystal, but the functional role of dimerization GPCRs is still being debated. 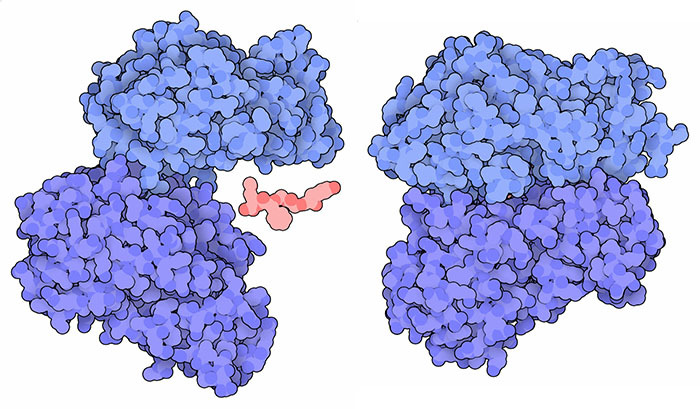 Try looking in the PDB archive for other GPCRs that form dimers. JV Pergolizzi, JA LeQuang, GK Berger & RB Radda (2017) The basic pharmacology of opioids informs the opioid discourse about misuse and abuse: a review. Pain Therapy 6, 1-16. 5e33: P Kumar, V Reithofer, M Reisinger, S Wallner, T Pavkov-Keller, P Macheroux & K Gruber (2016) Substrate complexes of human dipeptidyl peptidase III reveal the mechanism of enzyme inhibition. Scientific Reports 6, 23787. C Stein (2016) Opioid receptors. Annual Review of Medicine 67, 433-451. Y Shang & M Filizola (2015) Opioid receptors: structural and mechanistic insights into pharmacology and signaling. European Journal of Pharmacology 763, 206-213. 3fvy: GA Bezerra, E Dobrovetsky, R Viertlmayr, A Dong, A Binter, M Abramic, P Macheroux, S Dhe-Paganon & K Gruber. Entropy-driven binding of opioid peptides induces a large domain motion in human dipeptidyl peptidase III. Proceedings of the National Academy of Science USA 109, 6525-66530. 4ej4: S Granier, A Manglik, AC Kruse, TS Kobilka, FS Thian, WI Weis & BK Kobilka (2012) Structure of the delta opioid receptor bound to naltrinodole. Nature 485, 400-404. 4dkl: A Manglik, AC Kruse, TS Kobilka, FS Thian, JM Mathiesen, RK Sunahara, L Pardo, WI Weis, BK Kobilka & S Granier (2012) Crystal structure of the mu-opioid receptor bound to a morphinan antagonist. Nature 485, 321-326. 4ea3: AA Thompson, W Liu, E Chun, V Katritch, H Wu, E Vardy, XP Huang, C Trapella, R Guerrini, G Calo, BL Roth, V Cherezov & RC Stevens (2012) Structure of the N/OFQ opioid receptor in complex with a peptide mimetic. Nature 485, 395-399. 4djh: H Wu, D Wacker, M Mileni, V Katritch, GW Han, E Vardy, W Liu, AA Thompson, XP Huang, FI Carroll, SW Mascarella, RB Westkaemper, PD Mosier, BL Roth, V Cherezov & RC Stevens (2012) Structure of the human kappa opioid receptor in complex with JDTic. Nature 485, 327-332.